Material: High performance engineering plastic+polyethylene fabric+Nylon fabric+sponge layer. Anti-puncture: Subject to 20J kinetic energy of puncture, the body protectors are not penetratd at knife point. Impact resistance: Subject to the impact of 120J kinetic energy, the body protectors are not damaged or broken. Strike power absorbing: Subject to 100J kinetic energy strike at the body protectors, the colloid clay impress doesn't exceed 20mm. Fire retardance: The body protectors comply with the fire-retardance level FV-2, with oxygen index no less than 28%. 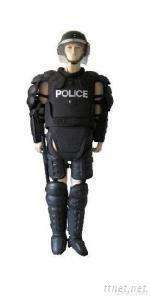 Protected parts: the Anti-Riot Control Suit /Body Protector protects the chest, back, arms, sides, shoulders, elbows, groin, laps, knees, shins, hands, neck, feet. Our business scope involves anti riot suit, bullet proof vest, stab-resistant vest, anti riot helmet, anti riot shield, duty belt and such security products. hope to establish win-win business relations with you.